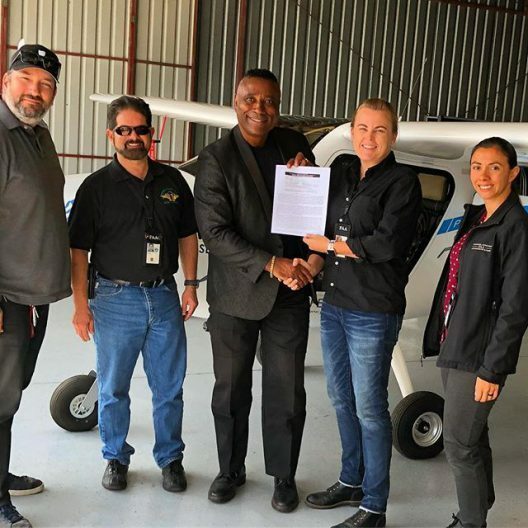 Following certification for Pipistrel’s Alpha Electro trainer in Australia, China, and Canada, the FAA presented this highly-valued acknowledgment that the aircraft meets current airworthiness standards. After waiting for the agency to remove the restrictive word “reciprocating” from its Light Sport Aircraft regulations, electric aircraft designers have permission to field aircraft with truly modern powerplants. With FAA inspectors painstakingly perusing every part of the Electros, a formal presentation followed, enabling the Sustainable Aviation Project to move forward with plans to bring low-cost pilot training to the Fresno, California area. Officials from the four cities in which Alpha Electros will be hangared were on hand to lend encouragement during the public flight displays of the aircraft. For a thoroughly modern design, the Alpha Electro is very light, at 368 kilograms (809 pounds) with batteries. Compare that to a Piper J3 Cub, which with a 65-horsepower Continental engine weighed 765 pounds empty. Adding 12 gallons of gasoline to fill its tank, though, would have given a weight of 837 pounds. Even that Cub would have used a minimum of four gallons an hour – $20 worth of non-renewable resources. The trainers are priced around $130,000 and with projected $3 per hour direct operating costs should fulfill their mission to bring flight training to a broader audience. You can see videos of the Alpha Electros flying and various local dignitaries commenting on the event here and here. 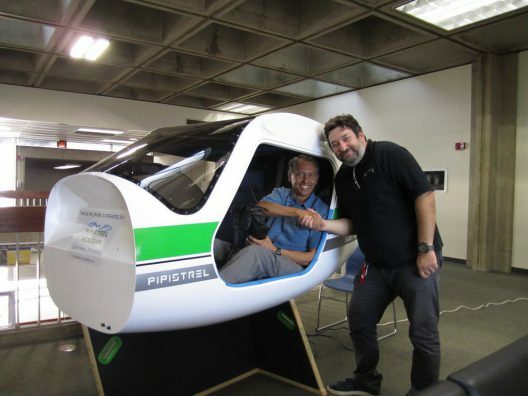 Sabi Apai, Pipistrel’s California dealer, delivered the second X-ALPHA Virtual Reality trainer to Cypress College, a community college located about 25 miles southeast of downtown Los Angeles. The first simulator has been operating at Compton Airport for several months, and more such units are anticipated in the Los Angeles and Central Valley regions. As reported by Apai, the simulator had to be lifted up “several flights of stairs (with the help of several students) because we missed out on using the service elevator by about half an inch. The virtual reality part is a huge sales point for this system. According to Pipistrel, “The single most important element of our simulator system is virtual reality. “The X-ALPHA uses VR (Virtual Reality) headset instead of the usual monitors. You can find more information about the X-ALPHA Virtual Reality simulator at this link. With highly developed and refined flight vehicles and simulators, coupled with quiet electric power and economy of operation, Pipistrel could be leading the way in introducing new and returning student pilots to a green aviation future.